I vowed when I left Paris to do my best not to compare and complain about the differences between life in France and in the U.S. Each has its highs and lows, pluses and minuses. I try to just go about my day being all Rebecca of Sunnybrook Farm and make the most of whatever side of the Atlantic I am on. And then. Sometimes, I am gobsmacked. And I have to express my, er, astonishment. Next week I have to go to our nation's capital and decided to hop on a train instead of battling the beltway. It's additionally a romantic notion because the train runs by my field, wailing its whistle at the crossing down the road. Makes my heart soar every time I hear it. So why not take the train? Why not, indeed. The distance between here and Washington DC is about the same as the distance between Tours and Paris, about 2hours 20 minutes by car. I bought my ticket for "The Cardinal," with the scheduled time of 2 hours and 50 minutes station to station. Okay, I can deal with that. Much as I lament it, I know that the US has no equivalent to the TGV, which can whisk passengers from Tours to Paris in just over one hour. But when I was picking up my ticket at the station the kind agent warned me (after I had paid), "Be sure to call this 800 number before you head to the station. The train is always late. Could be 15 minutes, could be three hours late, but it's always late." Labels: travel, where am I? In true Parisian fashion, a group of almost 10,000 swells took over the place de la Concorde on Thursday evening at 9:30, in an annual event known simply as Le Diner blanc, reports Le Parisien. Clad elegantly in all-white, the crowd assembled at the last minute (the place being revealed by text message), set up tables and chairs, sipped champagne, and feasted on their impromptu picnics, all without interrupting traffic. And they cleaned up without leaving a trace. Here is a clip from last year's Diner blanc on the Champs-Elysees. Uploaded by CLAPTV. - Watch the latest news videos. The days are getting longer, and summer is almost here. And my thoughts turn to... gazpacho. I pine for it. Yes, yes, I could make it myself if I hadn't given away my blender before I moved to Paris. But why make it when it's so easy to buy, already chilled, on the grocery-store shelf? Oh, the grocery store shelf in France, that is. This gazpacho by Alvalle is from the Tropicana Company in Europe. And it is delicious! So, come on, Tropicana USA! Get rid of your ugly new container packaging and design (which makes OJ bottles look like Clorox) and do something consumers would really love: sell gazpacho. I'd venture to say that this gazpacho is ubiquitous at summer dinner parties in France. Wrap an ultra-thin slice of jambon de parme around a breadstick, place across the soup-plate of store-bought gazpacho, and voila! A perfect first course. I found a website that offers Alvalle gazpacho to US customers for something like $25 a carton. Um, it's really good, but it's not that good. Please, Tropicana? Please? Help Americans with lighter fare in the summer. Let them eat gazpacho. What to do when I'm wishing I were back in Paris and longing for some good French cuisine? Why, I shop, of course! But lacking the requisite French culinary skills, I don't shop for groceries; I head straight to the book store. And today I found the perfect remedy for what ailed me. 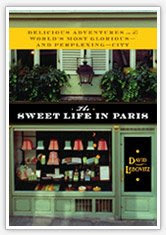 I purchased a copy of David Lebovitz's The Sweet Life in Paris, a fabulous collection of anecdotes about his life in the City of deLights. I'd been meaning to read it since it first appeared last month. From the introduction to the final page, the book reads the same way you would relish a French feast. Each chapter is like a dish to be savored. Delightful to the senses, pleasing array of perfectly-timed morsels. One course to the next sauced with David's tangy, well-honed humor. And punctuated by his best recipes (so tempting that even I might try them, kitchen flunkie though I may be). And, like a proper diner of an exquisite French meal, I devoured it appreciatively from cover to cover in one sitting. So if you, too, would rather be in Paris, treat yourself to The Sweet Life in Paris. The next best thing to being there. Here is the invitation, which arrived in my inbox last week. Fulfilling a lifelong dream! I was geared up, all systems go. Long story made short: it is almost 3 p.m. in Colleville-sur-Mer. I am watching the ceremony on TV from home. The Obamas are in Paris, staying at the Ambassador's residence on rue du Faubourg St. Honoré. Although the hotel particulier is gracious and oh-so-spacious anyway, there's extra room there right now, since the recent nominee for U.S. Ambassador to France, Charles Rivkin, still must be confirmed by the Senate. Mr. Rivkin's father was an Ambassador, so he has personal experience of expat life in the Foreign Service. And word has it that Mr. Rivkin does indeed speak French. More interesting to generations of popular-culture aficionados is perhaps the fact that Mr. Rivkin was the CEO of The Jim Henson Company. Hmm. The Muppets Take Paris has a zingy ring to it, n'est-ce pas? Maybe they just need to play this video at Mr. Rivkin's Senate confirmation hearing, and he'll be in like Flynn. Poor waitperson. S/he deserves not only a hefty tip, but also a consoling pat on the back. We can only hope that the French tourists in question were freshly arrived on our shores, where (ahem) tipping in restaurants is de rigueur. Especially when the waitperson has been so helpful. We hope that someone will advise them that in the US, le service n’est pas compris, before they create a mini-international diplomatic rift. Oh, the tipping conundrum! In France it’s never required, of course, since it’s included in the TVA/service compris. It is hard to shake the mindset sometimes, especially when you’ve just arrived on one side or the other of the Atlantic. So, for what it's worth, here’s a brief guide to tipping in France. 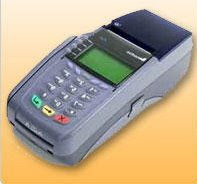 I wonder if the French guys just couldn’t believe that American restaurants don’t use those handheld credit card machines. 2. Random observation having nothing to do with pourboires.